This project is part of the worldwide “dena Solar Roofs Program” coordinated by Deutsche Energie-Agentur GmbH (dena) - the German Energy Agency - and co-financed by the German Federal Ministry of Economics and Technology (BMWi) within the initiative „renewables – Made in Germany“. 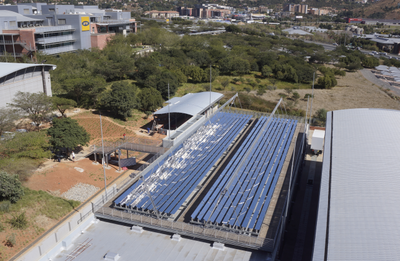 Industrial Solar has installed a Fresnel collector system at the leading South African mobile network operator MTN (Mobile Telecom Networks) in Johannesburg. The Fresnel collectors have a thermal peak power of 272 kW and power a double effect absoprtion chiller with a capacity of 350 kW. The cold is fed in the local district-cooling-system and reduces the consumption of fossil fuels and emission CO2. Since the prices for fossil fuels and electricity in South Africa increased in the last years the investment is motivated by both economic and ecological reasons. 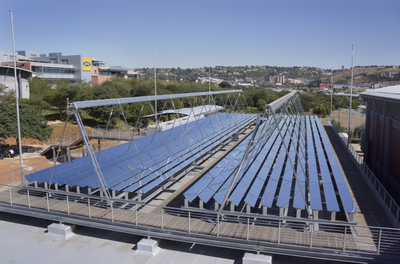 The “dena Solar Roofs Program” was developed by the Deutsche Energie-Agentur GmbH (dena) – the German Energy Agency. Launched in 2004, this program, co-financed by the Federal Ministry of Economics and Technology, supports German solar energy companies entering new markets. Within the framework of the program reference and demonstration projects are installed on the roofs of designated institutions in different countries around the world. The installation is accompanied by comprehensive marketing and training programs. These ‘beacon projects’ impressively present high-quality solar technology Made in Germany. 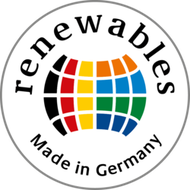 The initiative "renewables - Made in Germany" was launched by the German Parliament in 2002 and is run by the Federal Ministry of Economics and Technology. The main objective is to contribute to climate protection by stimulating the acceptance and use of renewable energy around the world. By showcasing Germany's technical expertise in the field of renewable energy and by organizing business trips to and from Germany, the export initiative facilitates business contacts between companies in Germany and abroad. The platform www.renewables-made-in-germany.com provides information about German renewable energy technologies and contact data of German suppliers. 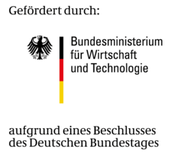 The Deutsche Energie-Agentur GmbH (dena) - the German Energy Agency - is the centre of expertise for energy efficiency, renewable energy sources and intelligent energy systems. dena's aim is to ensure that energy is used in both a national and international context as efficiently, safely and economically as possible with the least possible impact on climate. dena is working with stakeholders from the worlds of politics and business and from society at large to achieve this aim. Shareholders in dena are the Federal Republic of Germany, KfW Bankengruppe, Allianz SE, Deutsche Bank AG and DZ.